Black Lightning may not have a time-travelling superhero, but it does have a thorough understanding of the past. The past, with its influence on the present, its ability to contribute to a rosy nostalgia, and the way it creates wounds that never truly heal, is an integral part of the show, even with only two episodes under its belt. Unburdened by the formality of an origin story, Black Lightning is free to explore the kind of storytelling filled with regret, perspective, and honesty that, for a show like Arrow or Gotham, isn’t possible until a few seasons have aired. The result? A universe that feels alive, brimming with a history that’s shaped not only the city of Freeland, but also everyone that calls the place home. “LaWanda: The Book Of Hope” is an episode that deals with the past in a number of ways. Shared histories, and ones that are only known through stories passed down through generations, drive nearly every single character and plot development here. The episode title hints at the episode’s focus: LaWanda, a specific person in this living and breathing city, and “Book Of Hope,” the idea that there’s a history that she’s a part of. Her story, which ends at the hands of Lala, is the anchor for everything. Her single-episode arc encapsulates everything right and wrong about Freeland. She fights to get her daughter back from the Seahorse Motel, and ends up dead for her efforts. The cycle of violence continues. Principal Pierce may extol the wisdom of Dr. King to the worried parents—“the arc of the moral universe is long, but it bends toward justice,” he reminds them—but when he’s confronted with the fact that the Seahorse is back up and running just two days after he saved his daughters as Black Lightning, the words lose their impact. The people in the now don’t have time to see that arc eventually bend. “LaWanda: The Book Of Hope” is a smart extension of the patient storytelling that defined the series premiere. It’s an episode that could have aired right alongside last week’s, acting as another way into this world. If “The Resurrection” gave us insight into who Black Lightning/Jefferson Pierce is, “LaWanda: The Book Of Hope” goes further to show us how he’s needed in Freeland. More often than not the setup we get for a superhero is a vague sense of the city “needing” them, coupled with multiple showings from bad guys that, however interesting they might be, feel disconnected from the people that populate the cities that are being ravaged. We hardly ever get to know the citizens in these types of shows, but Black Lightning is already expanding its scope in a way that actually enhances the conflict and character work. More than that though, the expansion in scope allows for Jefferson’s struggles with his identity to feel not only more organic, but also urgent. As he’s drawn back into his role as Black Lightning, spurred on by Lala’s escape from the police and the Seahorse going back into business, he can’t quite figure out what his purpose is. 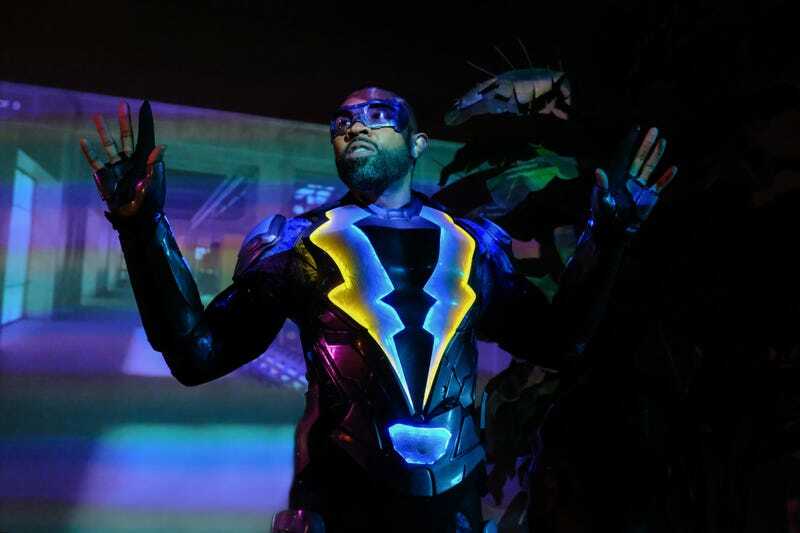 He tells Lynn, and himself, that Black Lightning storming the Seahorse was a one-time thing, a necessary foray into costumed crime fighting in order to save his daughters. But when he holds a meeting with the worried parents of Garfield’s students, he sees Black Lightning from a different perspective. “Why did Black Lightning only save your daughters?” asks LaWanda as other parents murmur their concern. Jefferson doesn’t have an answer. Every superhero show eventually constructs an arc where the hero questions whether he can serve his community in a meaningful way. It’s why Oliver Queen tried to legitimize himself with a mayoral run. Black Lightning, because of the aforementioned shirking of the origin story, is already able to go through that kind of internal conflict, and the show is better off for it. This isn’t the story of how Jefferson Pierce transformed into Black Lightning. It’s the story of how Jefferson Pierce comes to understand how necessary Black Lightning is. “LaWanda: The Book Of Hope” drives this idea home with two stunning interactions between Lynn and Jefferson. Their relationship, in its fraught state, is a big reason why the show feels so fully-formed out of the gate. Don’t get me wrong, there’s a deftness to other relationships too—Jennifer struggling but finding comfort in her boyfriend, and Anissa dealing with a non-commitment to her girlfriend while learning that she has super powers—but Lynn and Jefferson are the emotional anchor. The first conversation is one of affirmation and hope, at least to start. After Lala kills LaWanda, Jefferson makes a choice. He tells Lynn that while he understands her reservations about him being Black Lightning again, he can’t ignore that he’s not saving lives the way he thought he would as an unmasked leader in the community. LaWanda was a student of his, and she ends up dead. He could have saved her as Black Lightning, and he didn’t. That’s weighing on him. He doesn’t believe his school work is enough, and he has the perspective of nine years removed from Black Lightning informing his decision to don the suit again. “It’s time that the people know that Black Lightning is back,” he says. A triumphant moment for him, but the camera doesn’t follow him out of the room. Instead, director Oz Scott lingers on Lynn’s face. She’s devastated. That reaction shot is integral to understanding their later interaction, which completes the episode’s story of Black Lightning making his comeback. After Jefferson raids Lala’s place—Henderson shows up and the police arrest him for the murder of LaWanda, which she accidentally recorded from her car—he goes home to Lynn. They’ve been close to reconciling; Jefferson wants to move quicker, but Lynn, understandably, wants to take it slow. When he tells her that he’s bringing back Black Lightning, that he can’t wait for her or for justice any longer, she silently closes her laptop and leaves the house. There’s no room for compromise here on both ends, and the beauty of Black Lightning is that it’s nuanced enough to make the case that both Lynn and Jefferson are right. Or, if not “right,” at least justified in their positions. It’s a stirring, devastating moment that underscores the episode’s unique perspective: that despite the superhero label, there are real people at the center of everything that’s going on. Lynn isn’t ready to relive the trauma of seeing her husband suffer—something she’s forced to endure at the start of the episode—and who can blame her? And who can blame Jefferson for understanding that he has a higher calling, that he can’t, as he says, hide his family behind a white picket fence? “LaWanda: The Book Of Hope” is a brilliant follow-up to a confident series premiere, using small-scale storytelling to expand this world and complicate the revival of Black Lightning. Unlike with the bathroom sink, Anissa seems very pleased with her sudden super strength at the end of this episode. Another great interaction: Lynn and Gambi arguing over whether Jefferson was ever “addicted” to his powers. Jefferson is surrounded by people who are going to feel conflicted about his role as Black Lightning. This week in Black Lightning’s killer soundtrack: The sweet tones of Al Green.